From a humble Communion in Brechfa Church to a yuletide adventure through the sacred sites of the Holy Land, Patrick Thomas takes readers on a journey that promises to entertain, teach and bring a few laughs. Patrick Thomas is the author of several books, including From Carmarthen to Karabagh: a Welsh Discovery of Armenia. He has spent much of the past ten years studying Armenian history, culture and religion. In 2013 he was designated ‘Honorary Pastor to Armenians in Wales’ by the Armenian Primate of Britain and Ireland. Dr Thomas is Vicar of Christ Church, Carmarthen, Canon Chancellor of St David’s Cathedral, Pembrokeshire, and a member of the Anglican Oriental Orthodox International Commission. Late December is a special time of year for Christians around the globe, but none quite experience it in the same manner, or with quite the same level of joviality, as those of us in the land of song. 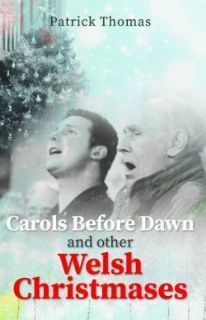 Having donned the mantle of priest, poet and historian, Thomas creates vivid images of modern and medieval Wales during the festive season. Whether the carollers are out in defiance of Lord Protector Oliver Cromwell, or carolling for warmth around two busted gas heaters, the spirit of this work should appeal to all faiths and creeds: it is the spirit of community, family and joy.